Pakistan’s relationship with its tribesmen along the Afghan border can best be described as transactional and the events of the 70-year history of the Pakistan-Afghanistan borderland has just proved that. It was 1948, a million people were killed and 15 million displaced in the bloody partition riots; Pakistan was less than a year old when its charismatic leader Muhammad Ali Jinnah decided to take the State of Jammu & Kashmir by force. Regular army of the nascent state was ill-organized and ill-equipped to engage in a full-scale war. The Pashtun tribes from the then Northwest Frontier Province were called upon and they did not hesitate to oblige. The tribesmen readily formed militias to invade Kashmir. A sizable part of the Kashmir valley was “liberated” and a border was demarcated with India deep inside Kashmir. Thus, the so-called LoC (Line of Control) came into being and the rest is history for the 45 million plus Pashtuns living in Pakistan. What they got in return was misery, death and alienation! Since then, Pashtun population in Pakistan has seen few good days. 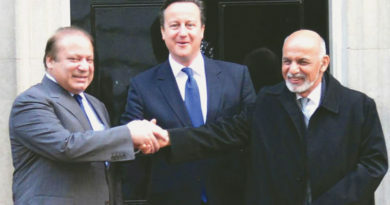 Afghan President Dr. Najibullah, was an ardent proponent of the Pashtunistan cause in the 1980s and 1990s and the Pashtun population on either side of the Durand Line was once again mobilized. The saga ended when Soviet Union collapsed and Mujahideen brought down the Najib government in 1992. The chaotic Mujahideen era was followed by the brutalities of the Taliban regime. Pashtuns, once again, had to bear the brunt of the Taliban atrocities. Pakistan, along with Saudi Arabia and UAE, recognized the Taliban government in Kabul and offered its unconditional support. The Taliban regime only lasted from 1996-2001 when the US invasion put a swift end to it. However, Pakistan once again needed the support of its Pashtun population to keep Taliban as a proxy force. 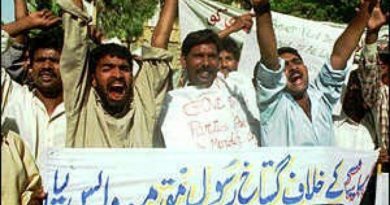 The Pakistani state has successfully co-opted its Pashtun population and a demand for “Pashtunistan” has faded away into oblivion. 70 years on, Pashtuns were still looking for a common cause and a rallying cry. Then a tragedy struck. An aspiring young man by the name of Naqeebullah, a member of the Mehsud tribe from Waziristan, was recently killed in the port city of Karachi by a high-ranking police official on the suspicion of being a terrorist. The only problem was, he wasn’t; Naqeeb wanted to become a fashion model and use his modeling to promote peace. Peace was not given a chance. It turned out to be a fake encounter, a joint investigation team found out that Naqeeb Mehsud was innocent and the Sindh police killed him in an extrajudicial manner. The police chief, SSP Rao Anwar is on the run since then. Mr. Anwar is allegedly involved in 250 such illegal killings. Who is protecting Rao Anwar is yet to be determined but he has proved to be beyond the long arms of the state apparatus. It appears like Pashtun tribes have had enough of it and the atrocities committed by the state of Pakistan have proved to be a tipping point. 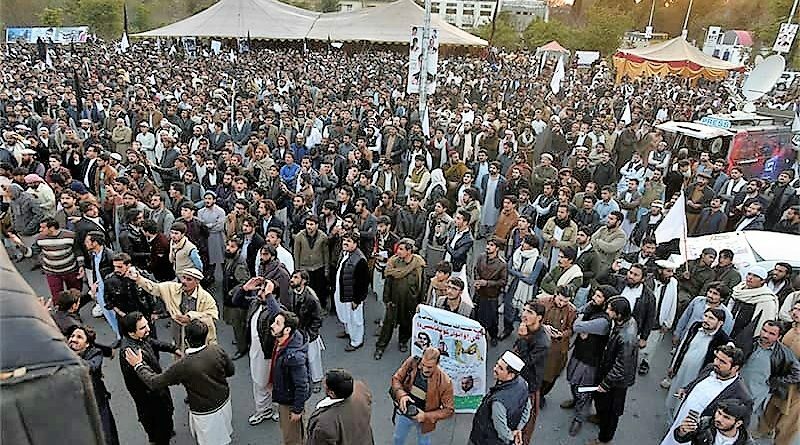 At a time when protest is redefining democracy, Pashtuns have mobilized themselves and today is the 10th day of their peaceful sit-in protest in the capital Islamabad. Pashtuns have finally found a voice! The Pashtun protest is unprecedented in the history of Pakistan; it is peaceful, organized and seemingly emanating from a grass-root basis. ANP, a Pashtun nationalist party is at the forefront of the protest and Pashtuns from all over the country are participating in it. The protesters are calm, and their demands are modest and genuine; arrest Rao Anwar and his team and present them before a court of law, recover all missing persons from the tribal areas, stop harassing and killing the tribesmen and clear the deadly landmines from Waziristan. The protesters are also hoping that the government would address their larger issues of streamlining the FATA and providing the people with basic rights at par with the rest of the country. “The Pashtun protesters have adopted an inclusive, dynamic & transparent process for the negotiations. They are not willing to let anyone of any stature hijack or control the decisions. It also showed the worrying disconnect between the Political leadership & the youth. Pashtun Long March has achieved key milestones; history has been made and can no longer be ignored.” said Bushra Gohar who has been attending the protest since it started on Feb 01. The protesting Pashtuns are mostly young and belong to the Generation-War. They have first-hand experienced large-scale internal displacements, unlawful abductions and detentions, ethnic profiling and stereotyping and humiliation at the hands of both terrorists and the Pakistani forces. They have lost dear ones to more than a dozen military operations and terrorist violence in the past two decades. The apathy of the Pakistani state is manifest in the fact that their sit-in protest has attracted very little media attention inside Pakistan which is otherwise robust in covering even smaller protests. The voices of resentment and marginalization are loud and clear, and the participants of the protest seem determined to have their voices heard. Can this protest prove be an eye-opener for the Pakistani elite is yet to be seen. Pakistan’s civilian and military leadership has treated the Federally Administered Tribal Areas (FATA) as a strategic playground and has failed to address the genuine demands and accede basic human rights to its five million inhabitants. For the past two decades, FATA has been used to mount attacks against Afghanistan in order to achieve the policy of “Strategic Depth”; to make Kabul subservient to Islamabad. Pakistani state has a transactional relationship with the Pashtun tribes straddling along the borderland between Afghanistan and Pakistan. The tribesmen have only been engaged when they were needed to fight Pakistan’s wars, but the Pashtun demands always fell on deaf ears, until now. Young Pashtuns see this as an opportunity for a meaningful engagement with the rulers who have so far treated them the way British treated their sub-continental subjects. 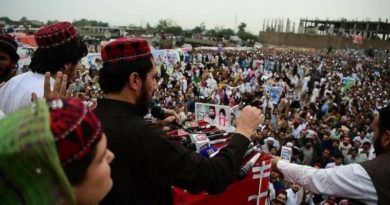 Pashtuns have long-standing structural and systemic issues which cannot be resolved overnight or through one sit-in protest in the Capital Islamabad, however, this is an encouraging sign that post-911 youth cannot be taken for granted. Afghanistan’s ambassador to the U.S., Hamdullah Mohib, tweeted on Feb 08 “Pashtun Long March in Pakistan is consequential for the entire world. It could be the beginning of the end of terrorism in the region. Moderate voices, speaking and mobilizing in masses against the use of extremism for domestic and foreign policy, should be supported and echoed”. Will this translate into an organized movement that will force the Pakistani state to revisit its long-held position on India-centric policies and strategic depth is yet to be seen, but who knows one day this protest may be remembered as a precursor to end the terrorism from south and central Asia. This piece first appeared in Small Wars Journal.